The so called kangaroo courtor Illinois Senate on Thursday voted unanimously to remove impeached Gov. Rod Blagojevich from office. Blagojevich was arrested on federal corruption charges in December. Federal authorities allege, among other things, that he was trying to sell or trade the Senate seat that became vacant after Barack Obama was elected president. After the governor’s arrest, the state House voted overwhelmingly to impeach him. A second vote, to prevent him from holding future state office, also passed unanimously. Earlier, the two-term Democratic governor — who avoided the first three days of his trial, opting instead for a national media blitz — gave a closing argument to the Senate. He said he had done nothing wrong. 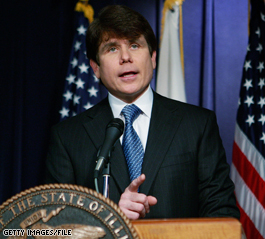 Blagojevich called on Illinois lawmakers to allow him to call witnesses to clear him of any wrongdoing. In his first cable news interview since his arrest last November for allegedly trying to sell President Obama’s U.S. Senate seat to the highest bidder, Blagojevich hammered away at the process that could remove him from office. Click here to see Geraldo’s interview with Governor Blagojevich. SPRINGFIELD, Ill. — The Illinois House of Representatives voted overwhelmingly to impeach Gov. Rod R. Blagojevich on Friday morning on the grounds of abuse of power as the state’s chief executive. He is the first governor in Illinois’s history to be impeached, and his case now goes to the state Senate for trial. The House deliberated less than an hour and a half before voting 114 to 1 to oust the governor, just one day after a 21-member House investigative committee unanimously recommended impeachment. The only member to vote against impeachment was Milton Patterson, a Democrat from Chicago. No one spoke up to defend Mr. Blagojevich. The last governor to be impeached was Evan Mecham of Arizona, who was removed from office in 1988 after serving 15 months. Blagojevich was arrested last month after federal prosecutors alleged, among other things, that he tried to sell the Senate seat President-elect Barack Obama vacated. The issue will now be taken up by the full Illinois state House of Representatives. “Today is the day that we begin to give back democracy to the people of the state of Illinois,” Democratic Rep. Jack Franks said as he cast his “aye” vote. Blagojevich “has been AWOL and derelict of his duties. He has abused his powers, and he has brought shame to this great state,” Franks said. The committee heard testimony Thursday afternoon from Roland Burris, the man Blagojevich appointed to succeed President-elect Barack Obama in the U.S. Senate. Burris denied any quid pro quo with Blagojevich for his appointment to the U.S. Senate. Burris, former attorney general for Illinois, is not accused of engaging in “pay-to-play” politics with Blagojevich. Blagojevich denies any wrongdoing and has rejected calls for his resignation. Kucinich may be barred from reading impeachment articles at impeachment hearing.